Miss Hepburn will always be known for her style, her poise and her class. Breakfast at Tiffany's is by far my favourite movies, I cry every time I hear her calling "cats" name. If I could wake up looking like anyone tomorrow if would be her. 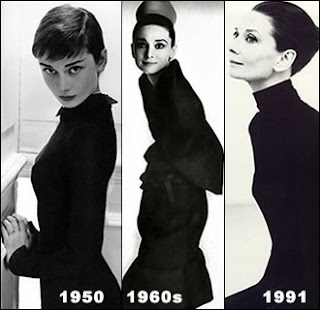 I am jealous of how she looked in cigarette pants and a black turtle neck, she had a great neck. She made the little black dress what it is today, simple, structured and classic. This is my simple take on an "Audrey" look using what I had in my own closet. You can't do Audrey without a strong black eyeliner, I'm wishing today I owned liquid even though I am awful at applying it. Her makeup was always clean, fresh, simple and elegant. Really she was just elegant! !